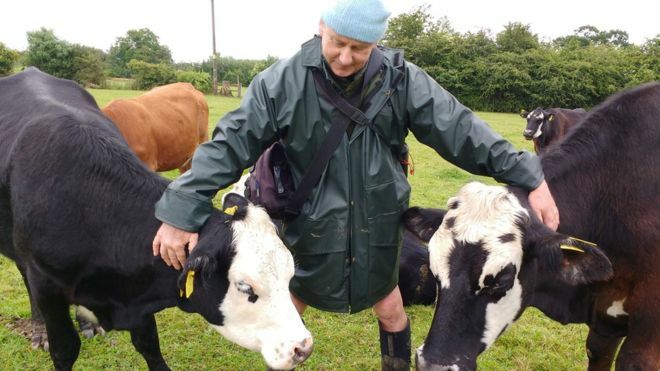 A vegetarian farmer has given his herd of cows to The Hillside Animal Sanctuary to protect them from the slaughterhouse as he could no longer bear to send them to be killed. 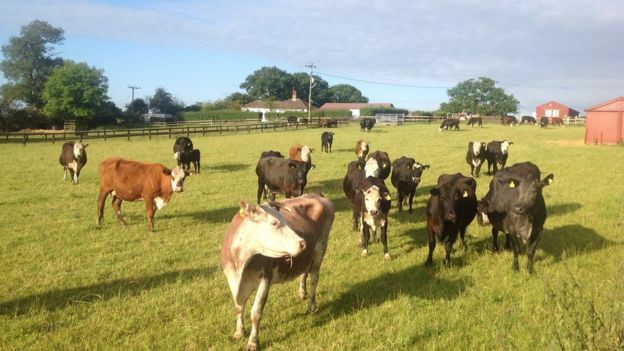 Jay Wilde, who farms in Ashbourne, Derbyshire, sent 63 cattle to a Norfolk rescue centre as he could no longer bear to send them to be killed. Mr Wilde, a vegetarian for 25 years, grew up herding cows and took over the family farm when his father died. “Cows have good memories and a range of emotions. They form relationships. I’ve even seen them cry,” he said. The Hillside Animal Sanctuary said 30 of the cows are pregnant and all the animals “would live out their lives essentially as pets”. Founder, Wendy Valentine, said Mr Wilde is not the first farmer to have donated his herd. She recalls a couple who “could not bear to continue dairy farming and kept their cows as pets with the help of the sanctuary”. Mr Wilde, who switched from dairy farming to organic beef production on the death of his father in 2011, said he always wanted to give up animal production because he “couldn’t believe it was right to eat them”. He believes dairy farming is particularly hard because calves and cows would often become distressed on separation. “I’m relieved to have made the decision to no longer farm animals, something which I always found quite upsetting,” he said. His brother-in-law told him he was “absolutely insane” to give away cattle which could fetch up to £40,000 at market. He said “a lack of imagination” had previously stopped him switching to arable farming. The Vegan Society’s report Grow Green (which encourages farmers to move away from animal agriculture and grow crops for human consumption) was given to Jay last year, after which he called them seeking advice on how to turn his farm vegan. The Vegan Society has had a number of meetings with Jay since then and were instrumental in helping Mr Wilde to find a suitable home for the 59 cows after contacting various sanctuaries. The Vegan Society put Jay in touch with the UK’s leading authority on stock-free farming, Iain Tolhurst, who is currently advising him about what he can grow on his farm. They are also assisting Jay with his transition and will be supporting him over the coming years. Tom Kuehnel, Campaigns Officer at The Vegan Society, said: “Jay first contacted us after hearing about our Grow Green report which encourages farmers to move away from animal agriculture and towards growing crops for human consumption. “The Vegan Society has been involved since the very beginning; we helped to find a new home for the cows and are facilitating the transition of Jay’s farm to plant-based agriculture. Mr Wilde will now be running a vegan organic market farm supplying garden produce without using animal products or fertilisers.